Collection of Bricks enforces the AMD-like module syntax for the declaration of modules and their dependencies (AMD stands for Asynchronous Module Definition). This ensures that dependencies are properly declared and are not referenced as a Global anymore so that dependency analysis can retrieve the used modules. It also ensures that declaring the modules and resolving the dependencies can be done asynchronously. The transformation of the core started with 1.54. For 1.56, the team worked hard to split the functionality of the jQuery.sap modules into several AMD-like modules. Until 1.58 the AMD-like modules were purely private and the jQuery.sap API still was the standard way to consume those functionalities. With 1.58 the new modules became public and were available for individual consumption by applications. For legacy applications, we introduced a stubbing layer. The duty of the stubbing layer is to avoid loading the full jQuery.sap module which has been established for compatibility reason. It acts as a façade by simulating the API of the jQuery.sap module and loads the fine-granular modules behind once needed. The topics of Asynchronous Loading and APIs are about the innovation of the UI5 module loader and the related APIs to load Libraries, Components, Views, Fragments, i18n texts and many more. The goal here is to avoid a blocking behavior of UI5 applications. Similar to the Collection of Bricks, Asynchronous Loading requires the introduction of the AMD-like module syntax which introduces an asynchronous break in between loading a module, loading its dependencies and the definition of the module. This allows the UI5 module loader to use asynchronous requests and load the dependencies behind the scenes. 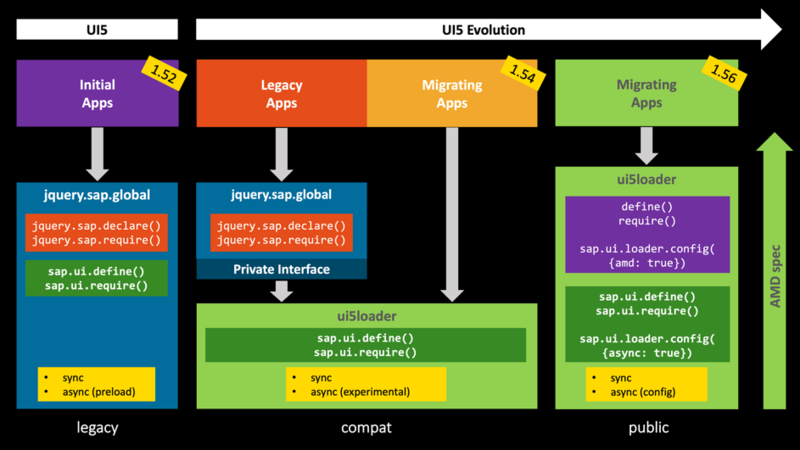 The innovation of the module loader started with UI5 1.54 by separating the legacy module loader API’s (jQuery.sap.declare and jQuery.sap.define) and the AMD-like module loader API (sap.ui.define and sap.ui.require). The AMD-like module loader has been externalized into a new module called ui5loader. The ui5loader was still working synchronously in 1.54 and could be switched into an asynchronous mode via an experimental switch. With UI5 1.56, the ui5loader has been released. The UI5 loader can be configured to simulate standard AMD APIs (define and require) as well as enable the asynchronous loading by configuration. In the future, the asynchronous loading will become the default but requires that modules have been adopted to use the new AMD-like module syntax. Otherwise, legacy modules could still run but require loading the sync loader and fallback to synchronous loading for those modules and their dependencies. Besides the module loader, UI5 also introduced new Asynchronous APIs. These are new factory functions for loading and creating Libraries, Components, Views, Fragments, i18n texts and many more. 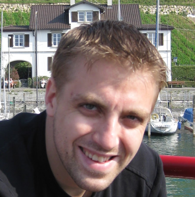 The new factories have been designed to explicitly require the factory functions and are work only asynchronous. This allows a proper dependency determination and that UI5 can introduce loading optimizations behind the scenes to improve the performance of applications. The legacy factory functions are still available for compatibility reasons but have been deprecated. 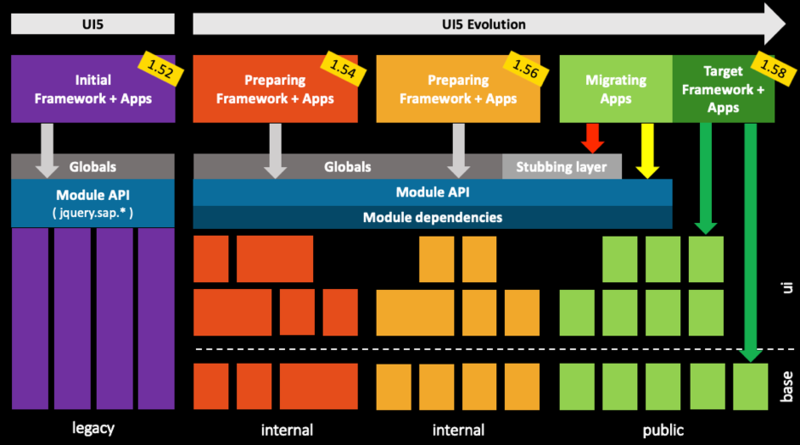 In the last innovation cycle of UI5, the Modular Core has been significantly refactored to provide more fine-granular modules to allow creating minimalistic bundles for applications. This makes some of these modules available for DOM-less environments to support the shift from runtime execution to build time, establishing new asynchronous APIs to overcome blocking of the browser. This comes in handy when loading resources and an asynchronous loader which improves the performance of module loading. All these steps are preparing UI5 to move closer to web standards which allows to leverage the latest web features and all the great stuff developed in the open source communities. ** AMD-like module syntax: it is a deviation of the AMD syntax since UI5 is using own API’s (sap.ui.define, sap.ui.require) to avoid conflicts and to manage slightly different behaviors.